What gave you the inspiration to start Paradise Row? Paradise Row is the name of a quaint cobbled street in Bethnal Green, where I live. It has beautiful terraced houses concealing the busy railway line that each day brings commuters into Liverpool Street. The area is often overlooked, sometimes under appreciated, but there is so much history to this street alone and the surrounding areas, which not many people know about. I wanted to start my first collection based on stories, and East London has a lot of them. I thought it would be a good idea to dedicate this first collection to East London and the make up of its culture. Let’s just say Paradise Row handbags come with an education. Do you have a background in the industry? I have absolutely no background in the industry except for the short course I did at Designer Courses. I took this course to learn about the craft of handbag making and the industry. But I didn’t realise how much I would fall in love with designing bags once I put it into practice. Before that, it was just ideas. I was working in banking and consultancy and Designer Courses gave me the foundation I needed to get Paradise Row started. How did you find out about Designer Courses? Simply from Google. However Designer Courses stood out from the rest. It offered an intense weekend course, it was reasonably priced and provided everything from pattern making to the final construction of the bag. What was the process of working with Designer Courses like - did you start with group classes or One-to-One with Katherine? I started with a group class which was wonderful. We were all at the same level and it felt like a team effort to try and create the bag of our dreams by the end of the course. Everyone was so friendly and offering help to each other. It was a weekend to remember. Following on from the course, I kept in touch with Katherine and she has recommended to me some good suppliers. I have also done a few one to one consultations for technical assistance on my designs. Were you looking for design help, technical assistance, business mentoring and introduction to manufacture - and how did this process unfold? I was looking for all of the above. Designer Courses is able to fulfil every one of those needs. The short course is ideal to build a foundation on design development and then the one-to-one sessions are best for more technical assistance. The business mentoring and introduction to manufacture intertwines with both. I cannot tell you how pleased I am to have found Designer Courses and to have met Katherine Pogson. How do you find Katherine’s approach as a teacher? Katherine is a wonderful teacher. During the course, she listened to your needs at all times, answered all of your questions and any difficulty that came your way, she made sure she was there at hand. I was incredibly impressed with how she managed 12 students, who all had no experience in pattern making or handbag design. It was not just about standing there and lecturing a group of students, it was a very hands on process, guiding each student on a one to one basis; it is something I wouldn’t have been able to do by myself. What has been the most challenging thing about launching your brand? Everything and it varies all the time. First, it is finding good suppliers for absolutely everything. From the leather to the manufacturers, to the packaging and the photography and art direction. Then it is managing the supply chain between all of them. Then it is managing funds, especially if it is coming from your own personal income and then balancing the time between running the business on a tight budget and thinking creatively for the next collection. Lastly, it is seeding the brand, getting it out there, for people to know you, it is much harder than one thinks. My brand is only three months old, so I am at this stage at the moment! However, I wouldn’t change it for the world. I am very proud of what I have achieved and I know I will overcome these obstacles and then the next challenge will come along! What are your plans for the future of the brand? I want the brand to be known as a place where people get their leather goods from. I want people to say, ‘I need an affordable luxury bag/wallet/passport holder/laptop case, I must have a look at Paradise Row’. This is my plan for the next few years to seed the brand, for buyers to have heard about us and the brand to become established especially in the UK. There is a lot to do to get that stage, I will be releasing collections on a regular basis, starting a basics range and hopefully also tapping into the men’s leather goods market. 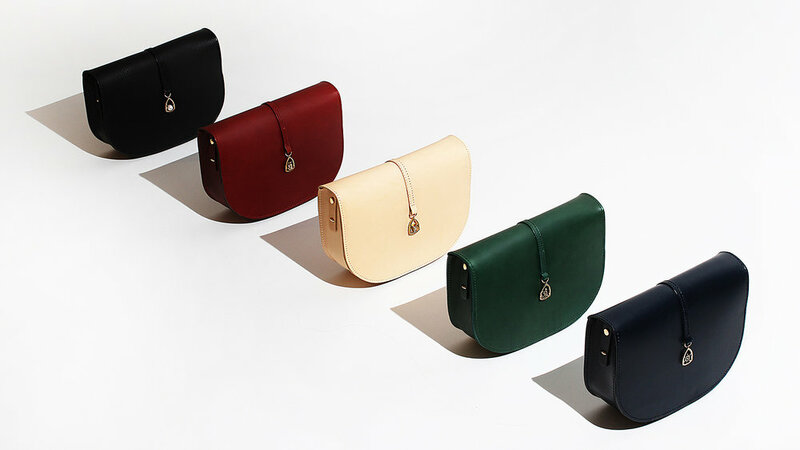 Which bit about being a handbag designer do you enjoy most? The part I love being about being a handbag designer is that designs keep popping into my mind and I see inspiration everywhere. Then to see these ideas come to life, there is no greater satisfaction and joy than that. What advice do you have for an emerging designer? The best advice is that you have to be prepared to have many hats on when entering this line of business. Unfortunately you cannot take a backseat and be just a designer. You have to be the accountant, the lawyer, the delivery guy, the social media marketer, the copywriter, the networker etc, about 10% of the work is designing when you first start. If you are happy to do all this then persistence and drive is key and you will eventually get there. You will have countless setbacks whilst building the brand, but at the same time you will have plenty of opportunities opening up to you after all that hard work.